The start to finish process of making writing instruments from historical and ancient woods. 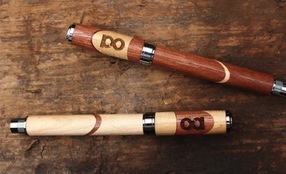 Handmade near Chicago, the Dynamo part of Allegory's Original Collection. The Dynamo is a rollerball pen made with Ancient Kauri and Bog Oak. About Ancient Kauri: 50,000 years ago in what is now Northern New Zealand a major natural event felled huge forests of Kauri trees that had been growing for some 2,000 years. This event also created bogs in the area, which protected these giants from the elements. Today these trees are typically found under farmland, where they excavated carefully and the ground is returned to its previous contours. Millennia underground have given Ancient Kauri unique characteristics such as whitebait, an opalescent grain quality reacts beautifully to light. About Bog Oak: At the end of the last ice age, rising water levels caused huge oak forests throughout England, Ireland, and other parts of Europe to die standing and fall into the muck. For the last 3,500 - 5,000 years these trees have been preserved in anaerobic conditions underneath peat bogs. The ages have turned Bog oak a deep black with dark brown grain. This is the result of a chemical reaction occurring between the tannins in the Oak and soluble irons present in the bog soil. 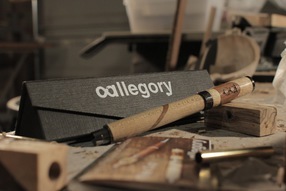 Handmade near Chicago, the Aficionado part of Allegory's Original Collection. 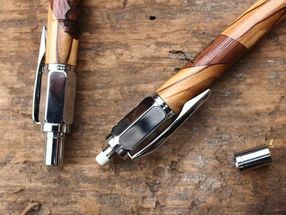 The Aficionado is a Parker-style retractable ballpoint pen made with reclaimed picklewood redwood and ancient Bethlehem olivewood. Prior to the onset and broad adoption of refrigeration technology, food preservation was a much more complex task. Pickling was a primary method of food preservation and a lifeline for many homes. Large amounts of lumber were required to construct pickling vats. Today these vats are no longer necessary in such quantity, and they provide an excellent source of reclaimed lumber. The compounds used in the pickling process add beautiful character to the wood. Throughout Israel there are olive groves that have grown for over 2,000 years. These trees saw Rome come to the area, and eventually fall. They saw much of Biblical history unfold; and they still stand today to bear witness to the trials faced by the region. These trees are highly protected, those who maintain them gather branch trimmings and deadfall and make them available to tourists and woodworkers. The dense, high contrast grain of Bethlehem Olivewood makes it ideal for small woodworking applications, its beauty and history are equally incredible. Handmade near Chicago, the Cap is part of Allegory's Precision Collection which features reclaimed woods, modern design, and customization. All Precision Collection Pens come with two color schemes, featuring both light and dark colored woods, and various writing styles including ballpoint, roller ball, pencil, and fountain pen. The Cap is made with Jakarta and Antique Maple. About Antique Maple: Reclaimed from barns and warehouses, Antique Maple is old growth timber that is a remnant of the great forests that once covered almost all of North America. Antique maple combines honey and tawny blonde hues with nearly translucent grain. Very reactive to light, antique maple has a unique shimmer and provides wonderful contrast when paired with darker woods. About Jakarta: The high volume of trade goods that come into the west coast of the US from Asian ports has created an entire market around reclaiming and reusing shipping containers. Jakarta is a blend of Asian tropical hardwoods that have been reclaimed from wood shipping crates that have made the journey across the Pacific. Its rich tones seem to retain echos of the journey, and one can't help but wonder what a particular plank helped carry across the ocean. Handmade near Chicago, the Click is part of Allegory's Precision Collection which features reclaimed woods, modern design, and customization. 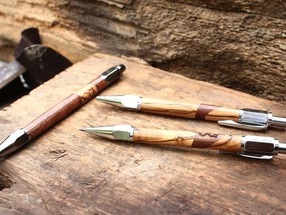 All Precision Collection Pens come with two color schemes, featuring both light and dark colored woods, and various writing styles including ballpoint, roller ball, pencil, and fountain pen. 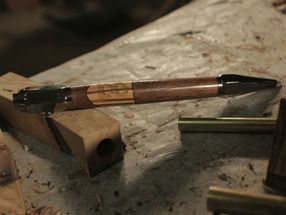 The Click is made with ancient Bethlehem olivewood and reclaimed black walnut. 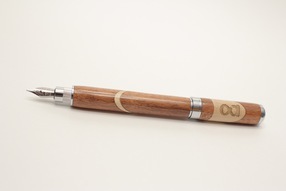 About Bethlehem Olivewood: Throughout Israel there are olive groves that have grown for over 2,000 years. These trees saw Rome come to the area, and eventually fall. They saw much of Biblical history unfold; and they still stand today to bear witness to the trials faced by the region. About Antique Walnut: Reclaimed from barns and warehouses, Antique Walnut is old growth timber that is a remnant of the great forests that once covered almost all of North America. Walnut's deep chocolate color, swirling grain, and subtle flame-like color variations make it very sought-after among woodworkers and furniture makers. Handcrafting our products makes each one unique. Variations in wood grain/color, nail/burrow holes, small cracks and imperfections are all part of the unique look and character of each instrument. We understand that these are highly subjective elements, and want each of our customers to be in love with their Allegory product. If you are unsatisfied with your purchase for any reason just let us know within two weeks and we'll happily replace it-no questions asked.